With the rise of the digital age and this time of one-hundred-plus TV channels, the ways in which TV shows compete for viewers is constantly evolving and heavily dependent on visual strategies of persuasion. Print and online advertisements, billboards, and TV commercials all attempt to engage audiences in ways that “mobilize symbols to influence diverse publics” (Olsen 9). One particularly interesting area in which visual rhetoric is used to attract and retain viewership is the opening credits of a television show; sometimes these credits have a residual identity—especially in terms of pop-culture—that far surpasses the show itself. Cheers, Friends and COPS are just three examples of popular American TV shows whose opening credits “invite complex responses from viewers […] frequently, of lingering and reflective consideration” (3). In these cases, the show credits and the accompanying songs are widely recognized across many generations and societal divisions with little to no prompting. In this paper, I will focus on the opening credits that begin Comedy Central’s The Colbert Report to explore how a successful opening credits reel will attract the attention of a potential viewer, leave a lasting impression on viewers and, most importantly, reflect the tone of the show through the strategic use of signifiers, code, and film technique. The Colbert Report is a satirical news program on Comedy Central that parodies the rhetoric, both visual and spoken, of political talk shows, particularly The O’Reilly Factor, with pundit Bill O’Reilly. Actor and political comedian Stephen Colbert hosts the show as a fictional version of himself—a self-proclaimed Independent who prides himself on remaining unbiased—but in practice leans heavily to the right wing. He is a loud and hyper-patriotic commentator who is usually slightly misinformed or under-informed on current political issues, but highly opinionated nonetheless. The opening credits of the show are tasked with representing this complicated, fictional Stephen Colbert, and indicating the premise for the show, but in under a minute and without dialogue. In How to Read a Film: The World of Movies, Media, and Multimedia, James Monaco discusses “cultural differences in the perception of images” (152). He states that images will only be successful insofar as they are targeting an audience that has been trained to understand them in the desired context. 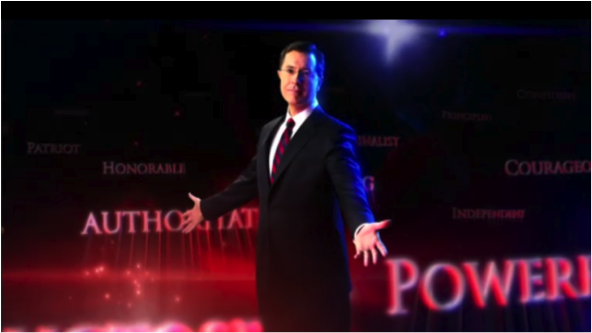 The opening credits of The Colbert Report primarily target an adult, American audience; thus, in order to make the credit reel successful, it must present rhetorical strategies in a way that the average American viewer can absorb and understand immediately. Within this particular credit reel, the main strategy is the layering of traditional signifiers of American patriotism. Bald Eagles, American flags (as well as the colors of the flag), and a visual of the ideal American patriot all make repeat appearances in the quickly paced and upbeat sequence. This layered effect creates an over-the-top, yet rhetorically compelling, digital film sequence to the show that simultaneously creates and perfectly reflects the identity of the show itself. The establishing shot of the opening credits introduces a black screen mottled with red light, abstract blue clouds, and sun-spots. The closeness of the red and blue against the deep black background gives the effect of looking into the distance of the night sky which naturally progresses into codes of expansion, manifest destiny, and the exploration of space. From the bottom right, a light radiates upward, creating a very faint rainbow on the outer edge of its rays. In Images, Power, and Politics, Sturken and Cartwright explain that “as conventions, signs can be a kind of shorthand language for viewers of images, and we are often incited to feel that the relationship between a signifier and signified is “natural” (30). This explains how, while the rainbow is a natural occurrence caused when light hits droplets of moisture in the air, it is often thought of less in terms of a natural event and more as a symbol. Relatively recently, the rainbow has become the prevalent symbol for G L B T awareness and rights; much earlier, however, the rainbow was established as a sign of hope and promise. In Bible story of Noah’s Ark., the rainbow was created by God as a symbol of the covenant between himself and Noah. Although the U.S. is founded upon the separation of church and state, Christianity is the predominant faith among Americans, and Bible stories like Noah’s Ark are referenced in many aspects of culture, including elements of pop-culture. Because this signifier/signified relationship is now so engrained in popular-American culture, it feels as “natural” as “identifying a rose with the concept of romantic love and a dove with peace [and] it becomes difficult to recognize that their relationship is constructed rather than natural” (Sturken 30). Visual strategists and rhetoricians are able to use well established signifier/signified relationships often without the audience’s realization of what is happening. Thus, in the case of this particular rainbow, the faintness does not matter because the viewer’s mind picks up on the image immediagely and the background instantaneously becomes a place in which hope has presence. Much more obvious than the arc of the rainbow is the bright white light and royal blue clouds that occupy the space in the bottom right corner of the screen; this suggested rising of the light out of the South Eastern corner of the shot illustrates the first line of the National Anthem: O! Say can you see by the dawn’s early light, as well as popular sayings such as, “The Dawn of an Age,” that reference the excitement and optimism of new beginnings and fresh starts, both contributing elements to the concept of the American Dream. Following the radiating light across the bottom of the screen, a red light shines——like the rockets’ red glare. Here the red light acts as an indexical signifier that represents flares, gunfire, and celebratory fireworks, all of which are codes that contribute to the American image of successful battles (especially in the Revolutionary War) and modern Fourth of July celebrations. As a combination, the light of the emerging dawn and the red glare from the bottom of the screen brighten the foreground thereby creating a visually dynamic backdrop for the first overtly symbolic sign in the credits: the Bald Eagle. In Signs and the Meaning of Cinema Peter Wollen states that a symbol is “an arbitrary sign in which the signifier has neither a direct nor an indexical relationship to the signified but rather represents it through convention” (cited in How to Read a Film: The World of Movies, Media, and Multimedia, James Monaco p. 15). In 1782, the Great Seal of the United States was adopted, and the Bald Eagle instantaneously became an official symbol of the United States. Because the adoption of the Bald Eagle as a suitable symbol for the center of the Seal was a conscious decision, the relationship between the Bald Eagle and the United States was, at first, a forced signifier/signified relationship. It is important, from a rhetorical standpoint, to remember that the original connection between the Bald Eagle and the United States is artificial. However, it is also important to note that, at this point in American History, the relationship no longer necessarily feels forced; instead, it begins to enter the same type of “natural” seeming connection that Sturken and Cartwright applied to roses of love and doves of peace. 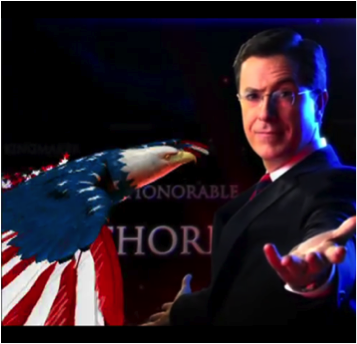 Because Americans now accept the Bald Eagle as a representation of the USA, it is significant that The Colbert Report’s introductory credits visually mock the reverence which might traditionally be associated with the eagle. A Bald Eagle animates the shot by entering from the right edge of the frame and cutting through the black, blue, and red background. It swoops through the center of the frame, toward the back, and then loops around to the front. The camera shot remains square through the duration of the eagle’s flight so that when his wings spread outward they occupy a large portion of the space. The eagle in this sequence is not represented realistically, but colored like the American flag so that the body is blue with white stars and the wings are red and white striped. This cartoonish depiction of the eagle symbol creates a dramatic, eye-catching, and can be read as either a sort of secular sacrilege or merely playful, depending on the audience. In this way, the eagle splits the audience into two categories: those that will likely be offended by the program, and those who will appreciate its tongue-in-cheek adaptation of American ideals into comedy. Throughout the entire opening credits, the eagle acts as a wipe for the screen and signals the transition of focus from one shot to the next. 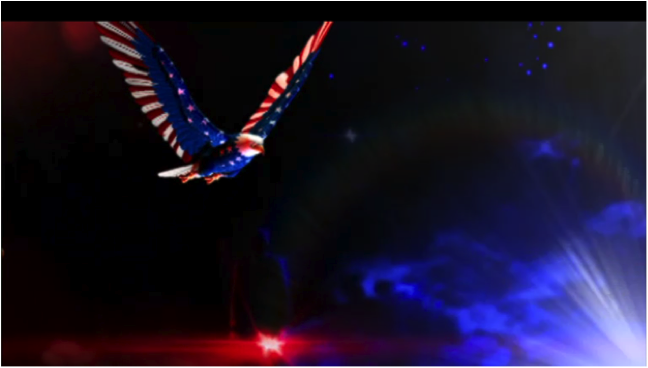 As the eagle turns forward and begins to descend to the bottom of the screen it wipes the screen downward and exposes a slightly sideways-standing Stephen Colbert in the middle of the frame. With this wipe motion, the viewers’ attention (the power) leaves the eagle and transfers to the image of the show’s host masquerading as an impossibly idealized white-collar, all-American business man. He is dressed in a tailored black suit, white shirt, and red and blue striped tie, his hair is conservatively cut and neatly combed, and he wears frameless glasses. Each of these elements is a visual signifier that summons codes of American ideals, such as financial stability, power, and authority. The look on Colbert’s face (stoic, but not unkind) further enriches this code to include an element of personality and individuality within the set context of American ideals. The viewer is situated slightly below Colbert’s eye level, which gives the impression of his elevated status as a man over the viewer; this implicit message is emphasized as his arms begin to rise out from the sides, palms up. This slow raise of the arm is a gesture of power and godliness, which becomes clear when his arms approach perpendicular and large words begin to ascend from the bottom of the screen and fill the background as if he has summoned them into being. As Colbert’s arms spread out, they mimic the wings of the eagle that has transferred the power of attention onto the host. To further emphasize this transferred power, the camera zooms upward and inward to a close-up of Colbert’s face. As the magnification reaches its maximum, he looks straight into the camera (at the audience) and raises his left eyebrow. This small change in expression immediately changes the host’s facial expression from “every man” to a slightly informal or insincere look that accurately represents his character in the show. That this slight gesture has the power to change the entire code that his face registers, but also make overt suggestions about the show as a whole is a clear representation of how powerful bodily signifiers can be. As soon as the raised eyebrow reaches and maintains its static position above the eyeglass lens, the eagle appears again, this time flying from the left of the screen straight across to the right. As it flies, the eagle wipes the screen clean of the old image (the givens the viewer is now familiar with) and exposes a new scene and information in its place. The eagle’s flight erases away the close-up of Colbert, and exposes an American flag on a pole at the front left of the screen, a forward-facing Colbert in the distance, and a background with more words than before. Because the eagle performs a screen wipe and the viewer does not witness the transition of the centrally-located, statuesque Colbert to the new, dynamically active agent, there is an element of surprise when new signifiers are suddenly present. The camera remains steady in order for the audience to witness this “new” Colbert run forward with exaggerated movement and a focused grimace on his face. The determination and fearlessness on Colbert’s face as he charges forward connects back to the original connotations of the red light as a signifier of war or patriotic celebration. In this instance, Colbert occupies the position of aggressor; because he is holding securely to the flag, however, his aggression is understood as in the name of America, not for himself. While it is patriotic to retain individualism in the peaceful and prosperous times that were depicted earlier in the sequence (as evidenced by his raised arms and eyebrow), times of difficulty and threat call for collective action and a focus on the group over the individual. As Colbert grasps the flagpole, leaps toward the viewer, and plunges downward into apparent nothingness, he enacts the codes that accompany a romanticized notion of military service in the US Army. 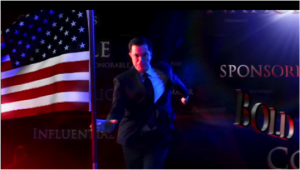 Colbert, clutching the flag, descends through a space that is defined only by the same black, red, and blue background that first established the setting. The camera begins to tracks his body downward with a vertical pan shot. Monaco describes the virtues of this type of cinematic pan: “First one subject has our attention, then the other; we are seldom interested in the intervening space, yet the cinematic pan draws our attention to just that” (173). In this case, the cinematic pan allows the reader to focus on the large words that first appeared when Colbert raised his arms at the very beginning of the credits. The words form a growing swirl and occupy the sky through which Colbert is apparently falling. At any given time, about ten words are fully readable, and the size and font allow the viewer to read quickly, without having problems focusing. The words are sincere and satirical. The majority of the words are sincere insofar as they are terms that are traditionally connected with American idealism, words like: Honorable, Patriot, Courage, Independent, Strong, Influential, and Constitutional. Because there is no spoken word in this film sequence, the words that float in the background space are of emphasized. Words, as symbols, have the ability to carry multiple levels of connotation, and this section of the film sequence asks viewers to explore these connotations in relation to both the identity of the show and the American identity in general. My little brother freeze framed his old credits with all the newsprint on it and caught, "President Bush I would like to have a hot dog with you."